Turnbull students work together each year to raise funds for three charitable organizations and learn the importance of contributing to both the local and wider communities. These campaigns have become highly anticipated annual events, and new initiatives are created each year. Students develop the creativity, team work and organizational skills necessary to run a successful campaign. 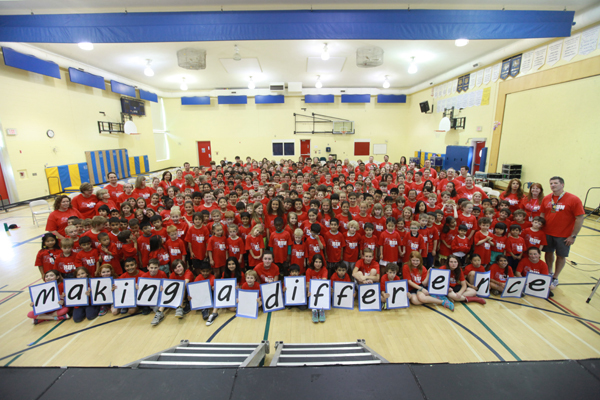 Our students become caring citizens through campaigns for United Way Ottawa each fall, Help Lesotho, where they are twinned with the children in an African school, and The Ottawa Hospital through the Family Walk/Run each spring. "We are a family who want our children to grow up knowing that we are put on this earth to contribute and to be thankful every day for what we have, so thank you for being a part of our circle of care for our children and for helping us teach those values." In addition, our Grade 7 and 8 students participate individually in local volunteer service to learn the value of being actively involved and making a personal commitment to helping their community become a better place for all. They are well prepared for the volunteer component of their high school program and already have seen the value of community service from their time at Turnbull School. 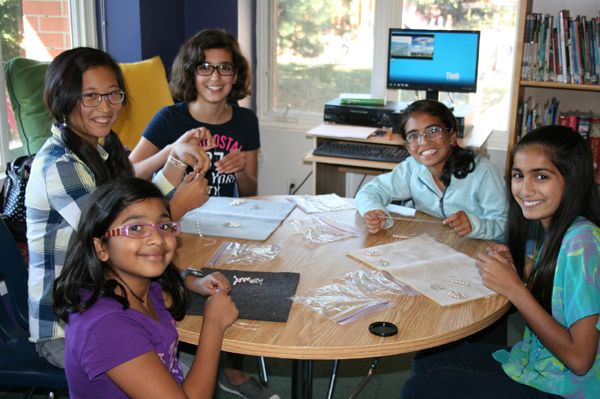 Students participate in a ‘Pearl Bee’ to raise funds for children in Lesotho. Turnbull students are recognized in the community for their contribution and eagerness to make a difference. Annually since 1998 we have been the “Top Fundraising School” for the National Capital Race Weekend. 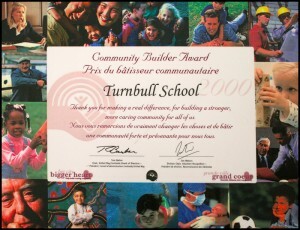 In 2000, Turnbull School students were honoured to receive the Community Builder Award from the United Way and it read “thank you for making a real difference, for building a stronger, more caring community for all of us”. In 2007 we were so proud of one of our graduates, Kristyn Ross, for achieving the same award for the community work she continued to do during high school. She had been one of our student leaders in our United Way and The Ottawa Hospital campaigns and carried that spirit of social responsibility, as so many Turnbull students have, with her into high school. In 2008 the Ottawa Hospital honoured our students with an “Inspiration Award” for their enthusiastic and substantial contribution to our neighbourhood hospital. The 2015 campaign saw Turnbull School surpass the half million dollar mark in giving to The Ottawa Hospital. In 2016, Turnbull School surpassed the one million dollar mark in total charitable fundraising. Mayor Jim Watson honoured this achievement on April 16, 2016 with “Turnbull School – A Million Reasons to Celebrate Day”. The United Way also honoured Turnbull School at their 2016 Community Builder of the Year Awards with the Community Impact 2015 Award. In 2017, Turnbull School was added to the Wall of Inspiration (2016) at Ottawa City Hall. The Ottawa Hospital presented Turnbull School with the 2017 Spirit of the Run Award in recognition and appreciation of our continued support and inspiring dedication to the hospital. We are so appreciative of all that you do and how you have encouraged our amazing daughter to shine and use her gifts in a way that is meaningful. We are a family who want our children to grow up knowing that we are put on this earth to contribute and to be thankful every day for what we have, so thank you for being a part of our circle of care for our children and for helping us teach those values. Thank you from a very proud and grateful parent!!! Another memorable moment happened just yesterday at Turnbull School. One of the Team members is Mary Ann Turnbull, and she asked Lucy van Oldenbarneveld and I to come by for their pep rally as the students got psyched up for the Race Weekend. This amazing school of kids from JK to grade 8 will field close to 400 participants in the 2k, 5k or 10k this weekend. I find this absolutely phenomenal. More impressive still is the fact that, for the past 10 years, the kids have raised money for the Ottawa Hospital Foundation. They do bake sales, kiss the fish, pizza and subway lunches as well as many other things to eek out their donations to this worthy cause. This year’s donation to the Ottawa Hospital Foundation is a staggering $46,241!! (I can only imagine how much a slice of pizza must cost to make that much money!!) From grade school kids!! That, my friends, is inspirational. Their level of social responsibility is something we should all strive to emulate. They are the ones setting the example for me to follow. If and when you see any of them out there this weekend, if you feel the same way I do, you should tell them so.